Breathable, moisture-wicking Sorbtek technology keeps you cool, dry, and comfortable. This yarn helps keeps its cool. 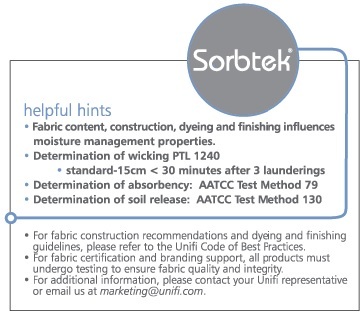 Sorbtex yarn fiber allows for quicker drying with a permanent moisture management technology. Acording to Unifi this fiber helps move moisture 4X faster than competitive technologies. It also helps protect against soils like sweat and grass. Unifi Manufacturing, Inc. is a leading producer of multi-filament polyester and nylon textured yarns and related raw materials. 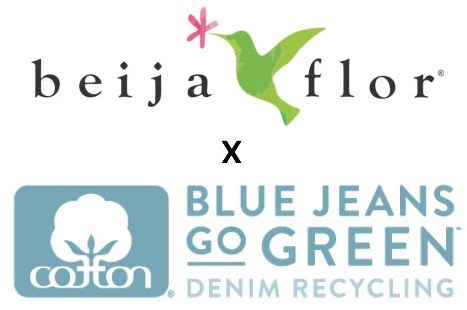 They provide innovative, global textile solutions and unique branded yarns for customers at every level of the supply chain. 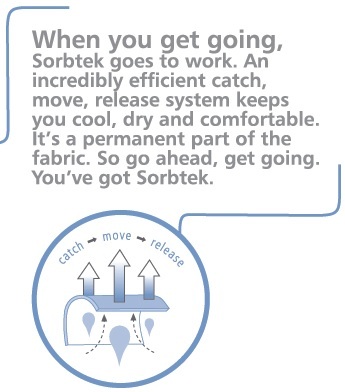 SORBTEK® provides permanent moisture management through their proprietary Catch, Move, Release technology. SORBTEK® catches moisture, moves it away and releases it for quick evaporation. The yarn is breathable, which leaves the wearer cool, dry and comfortable. In addition to moisture management, SORBTEK® offers inherent soil release properties to protect against soil such as sweat and grass.